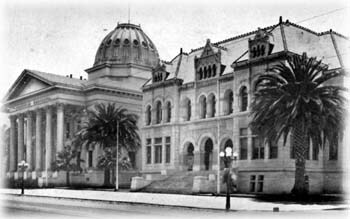 For the Record: The preserved Santa Clara County Courthouse, which was built in 1868 to attract the state capitol back to San Jose, lost its dome in a 1933 fire. Next door is the Hall of Records, which was knocked down in 1962 for detracting from the beauty of the courthouse. The first public fight to save a building purely for its historic and aesthetic value was waged for San Jose City Hall in 1958. The movement was vocal but faced hostility from a public that was abandoning the old for the new in the suburbs. Then urban renewal hit in the 1960s, and entire city blocks in San Jose and Santa Clara were bulldozed. While some Silicon Valley communities such as Palo Alto and Los Gatos got preservation movements going in the 1970s, it took until the early 1990s for San Jose preservationists to organize into an effective force. Between the 1950s and the 1990s, Silicon Valley lost some of its most historic landmarks. These are a few of the greatest hits. Built as a lodge for the Freemasons, Eagles Hall became an example of what historian Ellen Garboske calls "refrigerator-magnet preservation." In exchange for tearing down the hall, the Redevelopment Agency allowed the developer to preserve the historic entrance with its Greek Revival columns and facade. The columns and steps look nice from Saint James Park. The joke's on us, though. The real entrance is around the side. One of 1,648 libraries built by Andrew Carnegie, it was the last remaining in Santa Clara County. It was a Greek Revival designed by the Lenzen brothers, who also designed the old city hall. The library became part of the university in 1937 and was then converted into a student union before it was demolished to make way for the Wahlquist Library, which stands on that corner today. Louie Mariotti owned the Soda Works and sold bottles of Los Gatos Soda at local baseball games. He was offered the chance to become a Coca-Cola bottler but declined and continued to produce his own soda until the 1930s. Developer Dave Flick says he tried to save the Soda Works, but all he could come away with was some siding, the old sign and a few window frames. The Buffalo Building next door was deemed old but insignificant by the Los Gatos City Council and torn down as well. To see old Soda Works bottles, ask Chuck Bergtold in Patterson's Antiques on Main Street. Had the Weir been a car, its historic status would be undisputed. But for a building, it was young, barely 30 years old. No matter that it was designed by the most famous protégé of Frank Lloyd Wright and flaunted signature "Wrightean" horizontal lines. It was designed by Aaron Greene, who also built the Wright-designed county seat in Marin. The building was rare and different-looking, like a '65 Plymouth Satellite. Preservationists were late to build a case for the distinctive Weir, and it was torn down for the posh Italianesque Villa Torino apartments. The 113-year-old Civil War­era courthouse also served as post office and city hall before the "new" city hall was built. The Murphy was very much at the center of the civic and commercial life of the county. Activists had been successful in staving off demolition of the building, which was listed on the National Register of Historic Places. Then, in a maneuver that leaves preservationists bitter to this day, the developer walked into the city planning office at 4:45 on a Friday and asked for a building permit. Flustered, the clerk complied without checking the files. The wrecking ball hit the next morning. The council's guilt over the Murphy resulted in the creation of the Kelley Park Historical Museum. The vacationer's stopover on the trip to Santa Cruz was demolished along with city hall. The hotel was rebuilt in 1901 after burning to the ground a few years earlier. It was host to the rich and famous, including Charlie Chaplin when he was making films in the Santa Cruz Mountains. The deco facade is preserved, but the soul of the moviehouse is lost. Instead of advertising a summer blockbuster, the marquee points people to the businesses now housed there: Burger King, Century 21, a post office, Footwear, Etc., Nail Time and Intermission Marketplace. Ironically, because the theater was gutted to create a three-story mini mall, there will be no more intermissions. Julia Morgan, future architect of Hearst Castle, designed this, one of San Jose's finest buildings. Ornate wooden interior details were salvaged by the city before the building came down and were taken to the city storage yard in Las Plumas. Unfortunately, they were accidentally left out in the rain to rot. This heavy-set Romanesque fortress stood next to the courthouse, facing Saint James Park. It was made of granite and sandstone, with a gray facade of thick stones and arches. Those who applauded the demolition said it detracted from the county courthouse next door. It was razed in the push to update city buildings in the '60s. Like the Hall of Records, the Hall of Justice was a Romanesque building constructed of granite and sandstone. Also like the Hall of Records, it was derided as overwhelming and architecturally pedestrian compared to the nearby county courthouse. In the end, it was seismic concerns that brought the hall down. But this baby was built to last. The demolition contractor went bankrupt doing the job as the wrecking ball merely bounced off the old building. As with the celebrated Murphy Building 14 years later, demolition of the house caused a stir that started a preservation movement. The Sunnyvale Historic Commission was created soon after. Martin Murphy shipped the house from Europe around Cape Horn and owned most of the land that is now Sunnyvale. Today, none of the many Murphy buildings remains. San Jose's one-man redevelopment agency, T.S. Montgomery, built this, San Jose's first skyscraper. The richly detailed building of the past contrasts sharply with what sits there now--the Fairmont Plaza, a shiny marble and glass box festooned with bizarre rings at the top. Charles Herrold made the world's first radio broadcast from the Garden City building in 1909. The Redevelopment Agency now occupies the 9th and 15th floors. Like Weir, Costa caught preservationists unawares. The city Historic Landmarks Commission took up the cause for Costa, but couldn't save it from the wrecking ball. The hall was built as a lodge for the Portuguese-American contingent of the Native Sons of the Golden West. The commission considered it a contributing structure to the downtown historic district. The exterior of the two-story building was stucco. On the second floor were several ornate ceremonial rooms with bench seating and thrones. More than 200 bystanders gathered on October 26, 1989, to watch the demolition of Cooper House, extensively damaged by Loma Prieta. A young saxophonist played taps as the first few swings of the wrecking ball bounced off Cooper's Richardson Romanesque Revival walls. Briefly, the crowd cheered. But soon, after four days of smashing, the golden bricks came down. Cooper was, for many Santa Cruzans, the center of the universe. It had served as the county courthouse until the 1960s, then as the meeting place of the city's growing counterculture in the 1970s. After the earthquake, architects and engineers had mixed opinions on the condition of the building, but most argued that restoration should be considered. But City Manager Richard Wilson fast-tracked the demolition--begun one week after the quake--so that it would qualify for FEMA funding. From the July 2-9, 1997 issue of Metro.